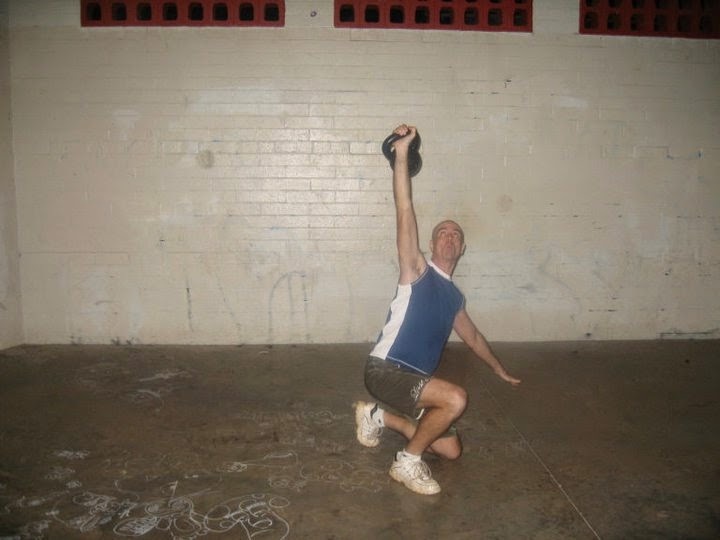 Kettlebells are a fantastic training tool. Not only are they incredibly effective, but they are also a lot of fun and versatile. There are countless exercises you can do with them. 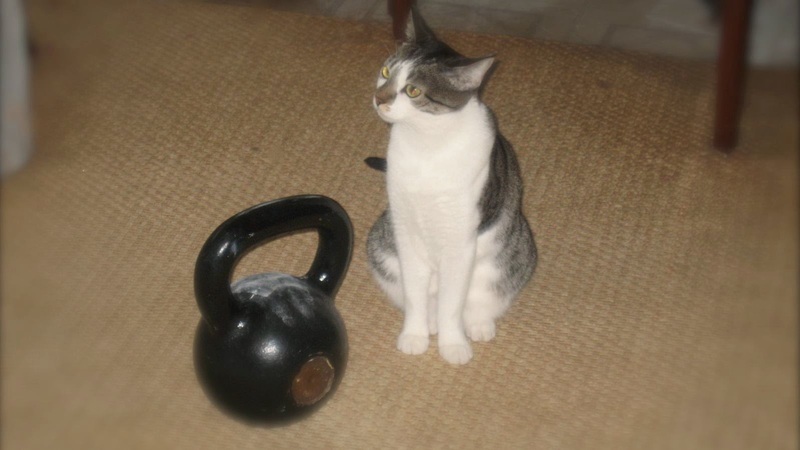 My cat Ziggy likes kettlebells, too. 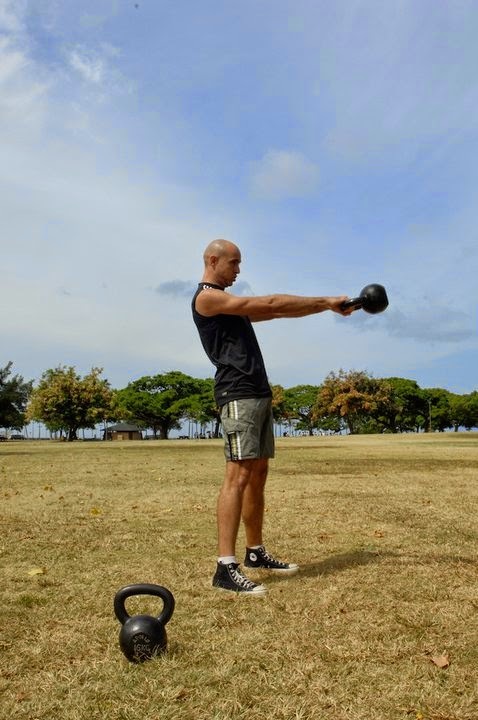 Ironically, the fact that kettlebells are so fun and so versatile can pose problems. At least, they did in my case. I found myself changing up my kettlebell routines far too often, just because I wanted to try new things. While variety can be a good thing, it can also work against you. There's something to be said for doing the same things over and over. Consistency counts. Monday, Wednesday, and Friday I do Turkish Get-Ups and Pull-Ups. Tuesday, Thursday, and Saturday I do Swings and Dr. Stuart McGill's Big 3 Core Exercises. I do Push-Ups and about 10 minutes of yoga daily. Occasionally, I'll throw something else into the mix; usually Goblet Squats. But the above has been the basis for my workouts for the last six months or so. TGUs in a faux gangsta environment. There's a reason I chose the exercises I did. They work. And doing them a lot and often makes them work even better. Have I become bored? No. In fact, I've grown to love the grind of doing the same things over and over. There's something almost Zen-like about it. Am I still getting results? If by "results" you mean getting stronger and leaner, then yes. "I am lost in preoccupation with myself, my fears, my longings, my memories, my plans. 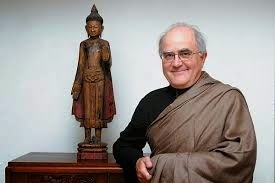 Whether walking, standing, sitting, or lying down, I am trapped in the prison of my own inner obsessions. I peer out on the world as though upon a foreign land." 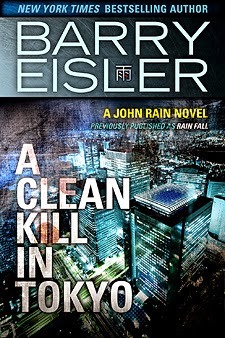 Barry Eisler is, in my opinion, the best thriller writer since the genre's glory days in the '60s, and his half-American/half-Japanese anti-hero John Rain is probably the coolest assassin in fiction, and one of the best characters since James Bond. If you're in to fitness and martial arts, the Rain novels are must-reads. Eisler lived in Japan for many years, where he earned his Judo black belt at the famous Kodokan. He also knows a bit about Brazilian Jiu-Jitsu, Kali, Sambo, and other fighting arts. The fight scenes in the novels are brutal, believable, and realistic. If you practice a grappling art, reading Eisler will make you want to put down the book and find a partner to roll with. In fact, sometimes before a hard BJJ session, I find myself thinking a variation of Bruce Lee's "Be like water." I think: "Be like Rain!" Grapplers should be excited to know that going against the typical grain grappling techniques are vividly described in the books many action sequences (in both John Rain's "field" work and in a visit to the famous Kudokan).